Two seasons ago, the Outlaws weren’t able to field a team of 12 for several varsity matches, but this year they will field a full team of 16 players. They return 10 of last year’s top 12 players who finished second to Philomath in the district tournament. Back for another year are seniors Jed Kizziar and Isaiah Chapen, juniors Drew Collins-Burke, George Bates, Eli Gurney, Aaron Johnson, Sam Mayes, Brogan Petterson, and Colton Seymour, and sophomores Nate Weber and KJ Sweet. Kizziar and Weber return as two of the strongest singles players in the league. Last year, Kizziar was undefeated in league matches as a junior and won the district singles championship. At state, he won the opening round and made it to the quarterfinals. Weber was just one match away from a berth in the state tournament last year as a freshman. He lost in the district quarterfinals. Chapen will also be a strong player for the Outlaws. Click stated that Isaiah plays a consistent and crafty spin game. Sisters also returns the top three doubles teams: Eli Gurney and Brogan Petterson, Sam Mayes and Aaron Johnson, and George Bates and Drew Collins-Burke, all juniors. New to the team this year are senior Keaton Green, and juniors Todd Gavin, Ambrosi Gabriele, Aspen Geisen and Morgan Spencer. Click told The Nugget that the full team of 16 will create great competition in practice which will lend to a strong varsity line-up. The boys tennis squad traveled to Sweet Home on Monday, March 11, in a “home” match against Redmond, and dropped the match 7-1. The match was both the Outlaws’ and the Panther’s first outdoor tennis match of the season, as both teams’ courts are still covered in snow. Sisters and Redmond both have brand new players who are just learning the game, so it was a challenge to play in their first match without ever being on an outdoor court prior to the match. The Panthers boast a strong 5A program and easily won most of the matches. The only exception was in No. 4 doubles, where Outlaws’ second-year player Colton Seymour and Aspen Geisen beat their opponents in two sets, 6-2, 6-4. Coach Carl Click told The Nugget that Geisen is brand new to competitive tennis but didn’t let his limited experience slow him down at all. Sisters No. 3 doubles team of George Bates and Drew Collins-Burke lost their match, but took several games, 2-6, 4-6. Senior Keaton Green, who’s a first year tennis player showed improvement in his second set, losing 0-6, 4-6, at the No. 4 singles spot. Three days later they traveled back to Sweet Home for another “home” match against Crook County (CC). It was a dual match and the boys and girls teams shared the four courts. Due to time constraints and court availability, matches were played in pro sets to eight games instead of two out of three sets to six games. Sisters came out on top and won seven of the eight matches. Sam Mayes, who usually plays doubles, played his first-ever varsity match at No. 4 singles and soundly beat Jordan Owens 8-1. Owens had played No. 1 doubles for CC, and played a second set at No. 4 singles because the Cowboys were short players. Sisters swept CC in doubles competition. Eli Gurney and Brogan Petterson (No. 1 doubles) won their first match of the season with an 8-5 victory over Yuya Yamaguchi and Jordan Owens. George Bates and Drew Collins-Burke moved up from No. 3 doubles to No. 2 for the CC match and beat Garret Bond and Tucker Bonner 8-4. Cole Seymour and Aspen Geisen are 2-0 after their 8-1 win at No. 3 over Nick Cushman and Kevin Chu. JV players Spencer Morgan and KJ Sweet moved into the No. 4 varsity slot and won 8-4 over Bonner and Yamaguchi to round out the sweep. Sweet has one year of experience, while Morgan just picked up the game and is learning on the fly. Jed Kizziar and Nate Weber are trading off the No. 1 and No. 2 singles spots. Kizziar defeated Jeremey McCoulah 8-4 at No.2. Weber fell 8-2 against Pablo Casado, a foreign exchange student from Spain, who is a very experienced player. The girls also posted a win (6-2) at Sweet Home against the Crook County Cowgirls. It was a first on the courts for both teams, and matches were played in pro sets to eight games just like the boys. Sisters won three of the singles matches. Kendra Sitz (No. 2 singles) tied her opponent 8-8, but went on to win 7-3 in the tiebreak. Holly Wertz won 8-6 at the No. 3 spot, and Molly Winter tied her opponent 8-8, but prevailed 7-1 in the tiebreak. The Lady Outlaws also won three of their doubles matches. Lauren Fitzke and Hallie Schwartz won 8-5 in No. 2 doubles, Sophie Silva and Lola Green won 8-2 at the No. 3 spot, and Ellie Rush and Hannah Ezell won 8-3 at No. 4. 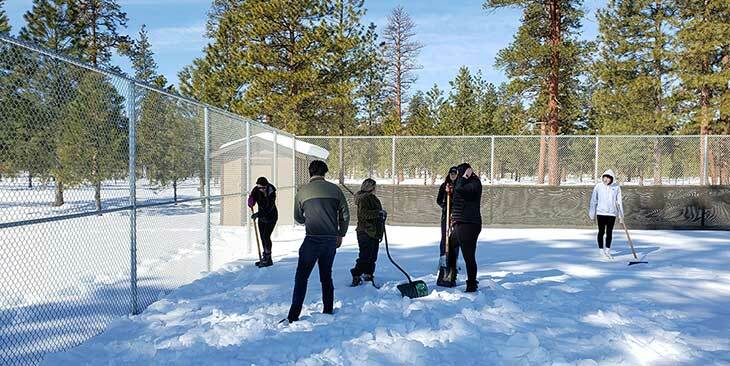 On Friday, the day after the match, about two dozen Sisters High School tennis players, boys and girls, used part of their day off from school to shovel snow from the home tennis courts at the middle school. Currently, both the boys and girls tennis teams have been practicing in the middle school gym with temporary nets and low compression tennis balls. Thanks to girls Coach VonStein, an Eagle Crest resident, players have been able to practice on their indoor courts.